It is International Whisky Day 27th March, the one and only genuine whisky day because it was not birthed from the grey goo of commercial intent mixed with a less than honest idea, but rather and among other reasons, to commemorate the life of the trailblazing whisky writer Michael Jackson. This one is a distillery special only. Every year at Feis Ile, the Islay distilleries have a distillery store only special release make available to reward those who have traveled to Islay. Pricing has always been fair on these bottles, which is great for those attending, but it does mean opportunistic reselling on the auctions the next month. Lagavulin’s is probably the most popular distillery release, and I have heard of queues forming from the early morning. Why this is so is probably due to the fact that Lagavulin does not have a large core range – it’s usually just the 16yo and the annual cask strength 12yo. Also up to 2015’s, all of these releases, including the Islay Jazz release, have been 100% filled and matured in European Oak Sherry casks. This is very rare. And not just that, it’s also heavily peated Lagavulin. There’s also a sense of being rather closer to the community, as the casks that went into this vatting were chosen by the ever cheeky and personable Iain McArthur, warehouseman extraordinaire 40 years and making. If you ‘get’ Lagavulin, you just ‘get it’. Nose: What can I say Lagavulin – and also true for cousin Caol Ila, is somehow just remarkably consistent. As long as it is consistently good, the drinker really has nothing to be critical about. I will say that this 51% noses more like a 43%, but you get the feeling more is happening ‘backstage’. More on ash, soot and dry smoke at the first, then the rich dirty phenols arrive gritty, greasy, new rubber and that vegetal-medicinal-chemical dirtiness I associate with mezcal. Thick graphite oil and crusted machinery. Clearly pungent but not immediately maritime. Ah oak and soothing sweet sherry. Dry dirty phenols chased by rich sherry. Very refined, the gentleman brawler of the three. Palate: Much more expressive. Clouds of dry smoke, a lapsang souchong bonfire – yes, lots of people say that, but it really does reek of smokey dry tea leaves, then waves of salt, soot, a full black ink-seaweed-limestone smoothie. Loads of phenolic richness, and its really quite complex in its little subtleties. Some wood tanins and rubber banks. Not obviously sherried, probably ‘built in’ into that dirtiness. Finish: Long. Dry smoke, oaky tannins, salt and rubber bands. Not immense but obviously very big, then again, doesn’t seem to be Lagavulin’s style to be immense. Very refined and elegant despite the very phenolic flavours, which are also very well integrated with the sherry. To think of it is really like very much like the 16 in that regard. Class act. My favourite. 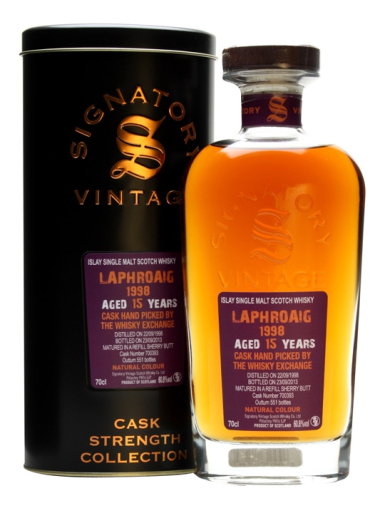 This one is one of the specials in the cask strength flagship bottle format done for TWE by Signatory, there seems to be a batch of them every year. And the few I have had have been very good. Also Laphroaig in sherry casks is not common, even among the independents. Nose: Completely and unapologetic-ally massive. Also a classic. Seaweed, seawater and what must be tincture of some old time cure-all cough syrup. Not hugely ashy, which is a relief. Need not describe more. The wood is drying and also quite loud. Stewed red berries and a bubbling jammy sweetness come out after a few moments. Very classic. Palate: Huge again, both the spirit and its strength. Medicinal as Laphroaig should be, more ash here but also salty, coils and coils of seawater soaked ropes, driftwood. Quite a few maritime elements but also lots of exhaust fumes and turning dry. Thankfully the sherry take something of a backseat here, allowing Laphroaig to show itself without being weighed down by excessive sweetness, whether sherry or bourbon. developing into some mentholy ashy notes. Finish: Long, salty, smokey and medicinal. Also lots of sea soaked sackcloth. Peat and sherry is a guaranteed knock out 1-2 punch here. If only it were old time sherry, and then you begin to imagine how great the legendary Laphroaigs must have been 30 years ago. 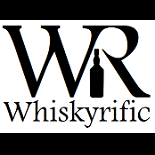 This entry was posted on March 27, 2016 by Whiskyrific in Lagavulin, Laphroaig and tagged Lagavulin, Laphroaig.